Spragg told The Gazette that contract deals with players for 2019-20 are largely finalised and that few changes of personnel are on the cards. He said: “We are pretty much done and dusted for next season. There will be very little change in terms of what we doing and the structure around the squad. “There are one or two things to be ironed out and we are looking to bring a couple of players in but the squad will be similar to what we have. “There is no need for much change and I want to keep faith in the lads we already have here. The coach was referring to the final three fixtures of the season, starting with tomorrow’s trip to Huddersfield. 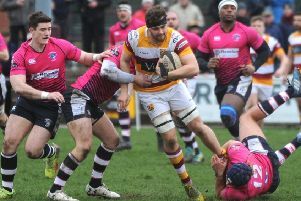 Like Fylde, the Yorkshire club’s promotion hopes were virtually dashed by defeat last weekend. Both now trail the top two, Hull Ionians and Chester, by 11 points with only 15 still on the table. If Huddersfield crashed out of contention with their 57-10 loss at Chester, Fylde’s second successive defeat came in more agonising fashion, 14-13 at Wharfedale. Spragg had no complaints and gave credit to the North Yorkshire club, adding: “It was a tight and niggly game, which is what you would expect. They did get the edge on us and just appeared to be a bit more streetwise in a hard, physical game. Tomorrow’s trip to Lockwood Park, which had long looked a key date in the promotion battle, may turn out to be little more than a third-place play-off but Spragg expects no problems in lifting his players. “That is not difficult,” he said. “We had a high-energy session on Tuesday and a good, positive talk. Huddersfield’s form has gone from one extreme to the other in past weekends, following their biggest win in this league, 91-24 against South Leicester, with their heaviest defeat. The league table suggests just that, with the clubs both on 88 points after 17 wins, a draw and nine defeats. Fylde’s plans for Wharfedale were hit by a series of injury blows which Spragg labelled “a nightmare”, though Jacob Conner should be fit for Huddersfield and captain Adam Lewis returns, having been unavailable last weekend. Spragg will again be without the club’s dual-registered players from Sale but he is proud to see two of them, Cal Ford and Bevan Rodd, selected for England Under-19s to face Wales on Sunday.